In the sanctuary of St. John’s Church last night, the coalition of activists called Plaza 16 held a community meeting to campaign against the large-scale housing development proposed for the 16th Street BART Plaza. Given the location of said meeting (and the overall tone of the night), it’s an apt metaphor to say they were mostly preaching to the choir—but really, they were rallying the troops. The room of about 80 people cheered enthusiastically. If there were any supporters of Maximus Real Estate’s proposal to build its 10-storied, glass-towered, mixed-use development with about 350-units above the BART Plaza, they didn’t speak up. This is the fifth event held by the Plaza 16 Coalition, which consists of a collection of several different nonprofits and activist organizations. At a meeting held at the Victoria Theater in May, more than 200 people from the neighborhood gathered to hear about the proposed project, but Thursday evening’s event had a more specific target audience: nonprofits and social service agencies. In a presentation about the proposed housing project, Gabriel Medina, policy manager of Mission Economic Development Agency (MEDA), spoke frankly about recruiting more neighborhood nonprofits to the fight against the developer. The coalition, he said, had to get there before the developer won them over. Medina explained that this 16th Street location is especially troublesome given the scale and inevitable high price of the market-rate units (which the developer has said will be for rent). Even when promises are made, getting affordable housing built here or anywhere in the city proves to be a slow and arduous process and even many promised projects remain unbuilt. Medina also explained that Plaza 16 wants projects to follow the “People’s Plan,” which was developed in 2006 by the Mission Anti-Displacement Coalition. He says that according to the Mayor’s Office of Housing, only 12 percent of the housing in the Mission has been affordable. The People’s Plan calls for 45 percent affordability for the neighborhood, with its high percentage of low-income families. After the meeting’s main presentation, Maria Zamudio, an organizer with Causa Justa, asked everyone in the crowd who represented a nonprofit to raise their hand. Most of the room’s hands went up. “Do you feel your nonprofit’s clients are especially impacted by gentrification and displacement,” Zamudio asked. Several responses of “yes” floated around the room. A few more hesitant yeses. At this point in the evening, organizers passed out colored cards to those gathered. 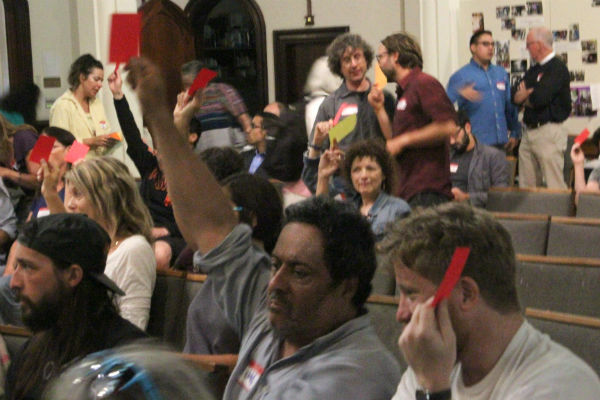 Zamudio asked those whose organizations were strongly opposed to the 16th Street project to raise red cards, those with organizations in favor hold up green ones, yellow cards for the undecided, and those seeking to be neutral to raise orange ones. No green cards. About two orange. A handful of yellow cards. A sea of red. At this point, the room split up into their respective categories. Organizers of Plaza 16 worked with those strongly opposed to the project in strategizing a campaign against it—including a march coming in October and the circulation of a petition. Those few people from organizations that hadn’t picked a side sat with Zamudio to figure out how they can get their nonprofit on board with Plaza 16’s campaign. One woman who works at a neighborhood nonprofit said that representatives from Maximus had actually met with her supervisors, but management was being very “hush-hush” about whether anything came out of that meeting. Zamudio acknowledged that developers can promise contributions to struggling nonprofits and the politics can be dicey, but she encouraged the woman to speak to her manager and make it known that she opposed the development. At previous meetings, representatives from Maximus have said that they’re willing to work with the community and respond to some of their requests. Given the tenure of Plaza 16’s meeting, they’re unlikely to find much common ground. As the evening was dying down, Medina said that from the list they’ve compiled of Mission nonprofits, they already had about two-thirds involved in the campaign. Maximus Real Estate’s project has some time to go before it reaches the Planning Commission for approval, but, if Thursday night was any indication, it’s not going to be smooth sailing. Funny how the people who want us to welcome all these undocumented people in with open arms are completely against anyone with a job moving here. Yes funny how they think. IIllegal moochers good. Legal citizens who contribute bad. Rent control has created a class of entitled crazies…. It’s you conservatives that hate poor people who are crazy. Go away, typical CONSERVATIVE bigot. The Vida development process established a very high price that must be paid to local non-profits before they will give their approval. Essentially a form of extortion – the reality of doing business in the city. We need to do a better job of educating people about how supply and demand works. The more we restrict supply, the higher prices go. The less fancy new condos, the more the rich folks will take up space in older victorians. If we just allow more supply to be built, a building that demands luxury prices today will soon be tomorrow’s working class building. Stopping this from being built won’t prevent gentrification – it will make it worse. The usual suspects that show up for meetings like this have no real concept of economics, and so are not troubled by the valid relationships that you describe. I’ve even heard some of them argue that building more homes drives up the price, which would be amusing if they weren’t expressed so earnestly. Their brief isn’t economics. It is a strange blend of NIMBYism and envy. They don’t want to see any million dollar condos built because they personally cannot afford them. They don’t like the people who can afford them and so wish to deny them homes. They believe they can micromanage the demographics of the neighborhood and of the city. Then they scratch their heads and cannot understand why there are so many Ellis/TIC conversions. This particular project has another compelling reason to be built, however. That corner is a cesspit, and this would help clean it up. And if you cannot build a high-raise tower on top of a BART station, then where? They’re not saying they want to stop them from being built–they’re saying they want it to be built as affordable housing. That will provide housing for the local residents and will help stabilize the cost of housing in the area while meeting the true demand. The current wave of speculators who are driving up prices will move on to other cities that look like easier targets. We’re lavishing tech companies with tens of millions in tax breaks–in turn driving up housing prices–now let’s spend some of the windfall cycle it created on affordable housing subsidization for longstanding communities. Supply and demand is not as simple as you are pretending. As someone who creates “demand” for a living, I know that demand is always at least half fiction. That’s a more complete picture of how supply and demand actually works, even in the areas of “necessities” like housing. You need to cite your claim that 25% of new homes in SF are second homes. It sounds like a wild exaggerated guess to me. Saying you want 100% affordable homes is ridiculous without a clear plan for how you are going to pay for it. Each home would require a subsidy of about a quarter of a million dollars, and I do not see a line of people wanting to pay more tax so that someone they don’t know can get a valuable asset on the cheap. You might as well ask a free pony. That’s how I feel about Twitter and the other Corporate Welfare Queens–I don’t want to pay their taxes or pay for their ponies! Where are we going to get the money??? Oh, right, we didn’t have it. So I pay i higher taxes. I don’t NEED to cite anything, but I am looking for the source of the 25% 2nd homes, it appeared in a recent newspaper article, and the source was a PRO-development group saying that it was ONLY 25% 2nd homes–so the real number is likely much larger. Here’s an article where people openly talk about using San Francisco as their rich kids playground and how they are all getting seconds homes here to crash after a night of partying. Saying I want 100% affordable housing in neighborhoods that desperately need it is called good economics and good community building. Drives DOWN speculative prices and increases housing stock. Something “market rate” will never do. Wasn’t at the meeting, but we should be very careful about approval of a 10 story building. It sound too tall for the area. Nothing is that tall, and it will block views, and cast a huge shadow, change wind patterns, etc. Mission is already having trouble “digesting” the amount of recent construction, so if this is slowed, its probably for the better. Lets build but careful that what is being built works and pays its share. I hope you are joking. We have an affordability crisis, and building a large residential building on top of a BART station is exactly what the Mission needs. This is a building that has public transit built into it. If you think random NIMBY concerns about shadows and wind should outweigh the environmental benefits of building atop our public transit infrastructure, you need to re-evaluate your selfish priorities. the proposed ugly Columbian high rise prison is not the answer to the newcomer problem. Its ugliness will last long after they are gone, so we have to be smart about only allowing a modified version if they pay their fair share to the people lives being disrupted. Why do you see newcomers as a “problem”? Isn’t America a nation of newcomers? Doesn’t San Francisco have a long and proud history of welcoming those who wish to move here? What about the Tech workers lives who are being “disrupted” who’s going to pay them? These non-profits are union busters! They hire non-union nurses, physicians and social workers, etc. The staff leave after just a couple of years so that they can get public health jobs with decent wages, healthcare and pensions. Affordable is just a code word for subsidized. Which means, you can’t have more affordable housing without unaffordable housing. Maybe the opposition could acknowledge this fact and create partnerships with developers to meet their goals of more subsidized housing.